This month’s featured startup has an idea that I’m surprised we haven’t seen executed until now. 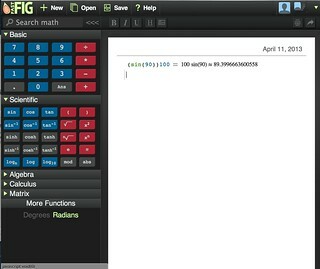 The company is fast fig, and the product is a cloud-based math word processor. They’ve basically applied the Google docs model to math, making typing equations as simple as writing a sentence, and making math available anywhere. Problems and equations automatically format, and literally solve themselves as you type, serving as a handy tool for checking work. In its’ current state, applications are limited to math tests, problems, and other educational uses, but I see a lot of potential in the technology they’ve already developed to do more than education. If they build in the correct templates, I could see this having financial applications, family budgeting, and many other math applications. They’ve already built in features for engineers (who I can attest, need to deal with a lot of numbers- dimensions, costs, standard deviations, etc.) and the platform can definitely handle these other uses. It could use a few more templates, but the technology already in place at Fast fig is pretty incredible, and I’d highly recommend giving it a try for yourself. It’s free to sign up, and you can check it out here.